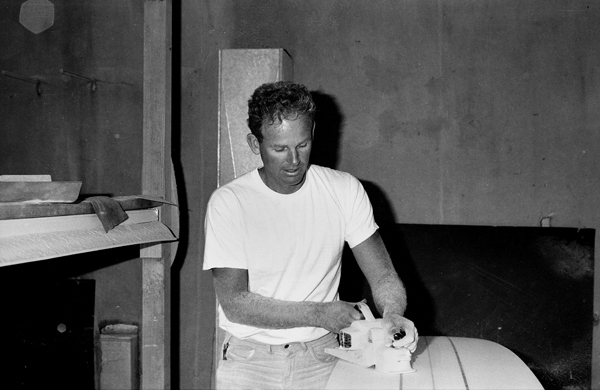 Hap Jacobs is a California surfer/shaper who was one of the pioneers of modern surfboard making. 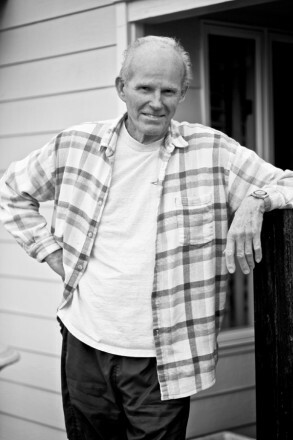 Along with his business partner Dale Velzy, Jacobs helped created the California surf scene in the 60s with his skilled craftsmanship and smooth surfing. We spoke with Hap to learn more about his life and times. I was lucky enough to have parents who moved me to the beach when I was in the fourth grade. I didn’t really want to move to the beach because I had some really “great” friends back in West L.A. You know doing things that little kids do—breaking windows on new houses and stuff. (Laughs). Back then, all the kids had the canvas surf mats, so I did that. I got my first job when I was 16, in high school, working at one of the surf mat places called California Surfrider. I would sweep the mats and pump them up with air. The benefit was that we got to ride them. Velzy and his friends were all surfing at the pier with their heavy redwood boards—this was in the mid 40’s. He would tell us kids, “Get outta here or we’re gonna run over ya.” He was the first territorial man I’ve ever met. Who did you look up to when you were a young man? I would say Dale. Everybody wanted to be his friend. He was the kind of guy that had a lot of charisma. Good surfer—seemed like he did everything well. He didn’t seem to go to school much. (The truant officer was always looking for him.) He always had the best looking girls and rode motorcycles and hot rod cars. Dale was probably the first guy I had seen who could walk up and down on a board. He was just one of those guys. What was the feeling you had when you first stood up on a surfboard? “Help!” I was on one of those terrible boards back then. You would get up and you could just push your way into the whitewater. You would pretty much go whichever way the board went. They had big, thick rails and were very sharp. But you would get up and go, “Whoa – this is really something.” There are so many accomplishments in surfing that it never ends. You start with things and it kinda goes on and on. You can actually improve pretty rapidly if you keep at it. And that gives most people quite a bit of encouragement. Tell us about surfing as a teenager. When I got a fairly decent board, before we had cars, these guys would take us to The Cove. There was the Palos Verdes Surfing Club. Guys like Hoppy Swarts and Leroy Grannis were there. They would tell us, “If you get into any trouble, we’re not taking you again.” The biggest thing in surfing back then was learning how to turn those boards. We couldn’t turn very well back so we tried to stay out of their way. Where did you learn the skills to make a board? I started in Hawaii and made a few boards. When I came back to California, I worked for a year atUCLA, but eventually left to do more surfing. They asked me why I would quit a job that included medical and retirement benefits. I told them I am going to make driftwood furniture and surfboards. You can imagine the look on their faces! Bev Morgan was a surfer and excellent diver, and he started making wetsuits, so we rented a little shop in Redondo Beach which eventually became known as Dive ‘N’ Surf. That was 1953. Bev made the wetsuits and I made the surfboards. The late Billy Meistrell of Body Glove got me hooked up with Dale Velzy. Dale thought it was great idea to work together because one person could watch the shop while the other went surfing! We each made six boards a week and that’s how the Velzy-Jacobs business got started. When did you stop shaping? When the 70’s started, we stopped making boards when the shortboards came in. The drug scene started up then. Everybody wanted shaping appointments, and they were going to come in and tell you how to shape a board. It was just stuff that seemed kind of ridiculous. About longboards, Phil Edwards once said in an article, “You couldn’t give them away.” So I went fishing. What attracted Greg Noll, Bruce Brown, Mark Martinson, Dewey Weber and yourself to commercial fishing? Doing something on the ocean, I think. When I was a kid, I liked fishing a lot so I started doing commercial swordfishing, and that was a lot of fun and we could make some money at it. Greg started crabbing above Eureka and he came down here with his swordfish boat, but he didn’t like it. It’s a kind of thing where you can drive around for a couple of days and not see anything; it’s can be super, super boring. But when you see one … it’s a whole different thing. What got you started shaping again? In 1991, Donald Takayama called me and said, “You better come down, we’re going to have a contest.” My wife and I went down there and we said to each other, “Maybe we’ll know somebody down there … at least Henry Ford and Donald. We got down there and, of course, we knew about three-quarters of the people there—most of whom I hadn’t seen in years. Donald told me had a Skil planer to give to me along with a bucket full of parts. When I got it back home, I noticed it said “Aipa” on it. Well, I was using it for three or four years and all of a sudden Aipa shows up at the shop, just to talk. He would just talk and he kept looking over at my planer. I said, “Ben, I notice you keep looking at my planer.” I then showed him his name written on it. He didn’t know what to say exactly. I quickly replied, “There was nothing in it when I got it, Donald just gave it to me with a bunch of parts.” Ben finally said, “Well, I guess it’s in good hands!” He then gave me one of his stickers and he placed it on my wall. Tell us about your famous Jacobs logo design. I had to sit and think of something when Velzy and I parted our business together. If I am going to start making boards on my own, I better start thinking about my logo. I started drawing a diamond for some reason. One of our most popular items was a visor that we would put our logo on. We sold tons of those things. Every kid on the beach had one. How important is craftsmanship to you? Oh, very. Sometimes it takes a little longer. If you are going to do something, you might as well do it right. How would you describe a good surfer? Style and knowing what they are doing. With shortboards, it’s kind of like “turn and spray.” Then they’ll do some tricks, fins first, whip around and get a lot of air. It’s different. If you watch someone like Phil Edwards or Miki Dora, someone who is really smooth and knows exactly what they are doing and they catch the right waves, it’s just perfect. Style to me is important. It’s something I’d rather watch. Who do you feel is shaping the path for surfing today? Jon Wegener. He surfs the bay over here. He used to shape the medium range boards for me. I kept my eye on him and he just kept improving over time. Now, he’s got these alaia boards. He’s pretty inventive; he’s always trying to improve things that nobody else is doing. Matt Calvani is a great shaper. He’s got a great eye and is very particular. They do their own glassing up there and everything they do, they do well. It doesn’t leave the door unless Matt has taken a good look at it. Of all the places you have traveled to what place stands out and why? Hawaii. I was in the Coast Guard on buoy patrol and we would travel to all of the different islands. We really got to see how island life was back in the 50’s. I shared the boat with George Downing, probably the best waterman at the time, and I met my wife there too. Taking a couple of months off from the boat, I was able to meet many of the most well-known surfers real quick. I had a board in town in a locker at Waikiki and I kept a heavy, curl-type board over there in Makaha at a friend’s house that George Downing shaped for me. It was perfect. Probably the best time in my life. Surfing. It’s what I enjoy doing. And, of course, shaping. It’s still fun putting a plan shape on a board. When I shape, I am always thinking of way to make a better board, especially if I am going to do a board for myself. Mostly, I really enjoy doing custom boards. I get to meet the people and I get to find out exactly what they want, their ability, what they prefer and how they surf. And I get to see their faces when they come and pick up their board. It’s a good feeling. What meaning does surfing hold for you and how has it changed your life? I don’t know. It’s kind of a continuation that just keeps going on. There’s something about the ocean—it’s something you can look at. It’s where the land ends and everything is done there. It’s mesmerizing. I really can’t explain it. What’s the greatest thing you have learned in your life? Not to argue with my wife. That’s it. Having fun. And still being able to make a living doing something I love. More information about Hap Jacobs Surfboards can be found here. Vintage photography provided bySteve Wilkings.